CaptainDoor intercepts and monitors traffic from mobile apps, even those with encrypted data, and report those in a single human-made PDF. With CaptainDoor you can see all HTTP you send & receive (transparently without any proxy & intercept HTTP(S) traffic). Intercept & HTTP traffic from almost anywhere, including HTTPS. Smart formatting available for JSON, GraphQL, XML, and others. Diff HTTP requests & responses to understand failure cases. Explore overall performance metrics & see security warnings for problematic requests to spot non-functional issues early. What problems does CaptainDoor solve? See everything that’s sent & received from a mobile app, at a glance. Understand, remote debug, or reverse engineer any web traffic on your network. 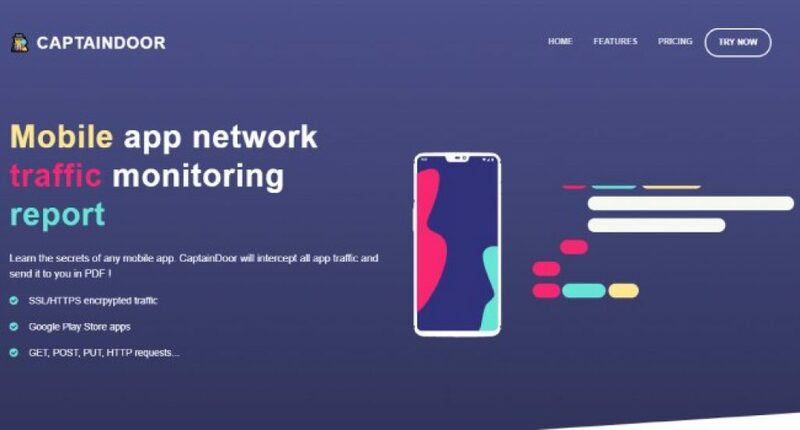 CaptainDoor allows anyone to get a full report of network traffic coming in and out of a mobile application, even if it’s encrypted SSL data. The report allows you to inspect API calls and traffic, with the goal to analyze and increase network security. Network security agents, API developers. Most applications available such as ‘Packet Capture’ use Proxies, and can’t provide HTTPS/SSL encrypted data, while CaptainDoor can! Since they were kids, the founders of CaptainDoor have been keen on looking for flaws and weaknesses on the world wide web and in mobile applications. Passionate about API’s and network security, which is now more than ever a major subject, they try to make their passion a useful tool for every developer and project manager of mobile apps. Early stage as well as growth stage companies (or even small one individual business) that use mobile apps or APIs can’t ignore network security and traffic monitoring.